Paper and pencil are all the go for me at the moment. No email, Facebook or Twitter distractions … and about 100 half used notebooks dating back to 1993! Library notes, Yoga notes, tute notes, ideas – all part of my ‘long drawer’. I sometimes wonder what will happen to all this stuff when I shuffle off the mortal coil … I hope the paper is recycled! There is quite a lot of this ‘stop start’ writing going on at present – trying out ideas to see what is going to work. Pencil and notebook is still my favoured way to feel myself into the space to write. In fact, I’m not writing at the moment, I’m planning the first Yoga class that I’m taking at Contours in North Mandurah … it is going to be fun! I haven’t taught in a gym for such a long time. This is a 6 week course for beginners. Yesterday we saw at least 2, possibly 3, dolphins in Falcon Bay. Two of them were big and I am sure I saw a small one with them. They weren’t frolicking, just gently rolling through the swell, back and forth not far off the beach. As we walked the dolphins kept pace with us and then they turned and went out to sea for a way before coming back toward the shore. They were feeding and not interested in doing acrobatics. Although we don’t see that many dolphins off the beach, they are often in the canals at Port Bouvard, they chase the fish into the smaller canals to make it easier to hunt them. I found this image here so hope it is ok to use it. We caught sight of the big dolphin’s fin as we came over the ridge and our first thought was “shark”. We are all a bit skittish about sharks at the moment since a swimmer was taken, possibly by a great white, off Cottesloe Beach a couple of days ago. He was having his early morning swim. His bathers have been found but no sign of his body. 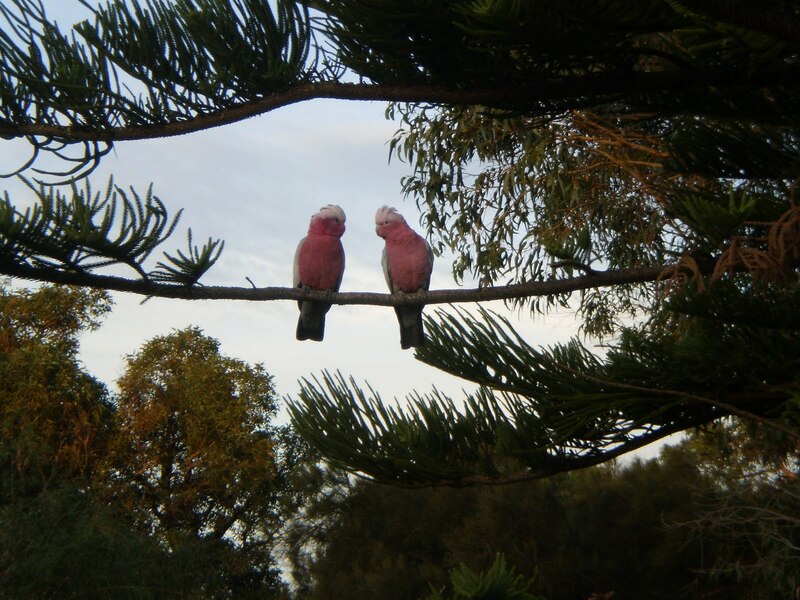 On the walk home we heard the bronze-wing doves, they are still making their plaintive, haunting noise to attract a mate. The male sits up on a power pole and you can easily see how his chest puffs up as he takes in the air to coo it out. It seems they are territorial and every second power pole has a resident dove. This morning, I was walking with the LBD – Roland went fishing at some unearthly hour – and I saw a crested pigeon sitting on a branch. Such a funny little top-knot! There are many bigger birds around here, ravens, magpies, currawongs and ibis. The smaller birds are less obvious – I think because so many are killed by cats and foxes. I have seen some silver eyes in our garden and the smaller wattle bird. There is a big wattle bird that lives at the bottom of our garden and he (it must be a he) is extremely territorial. 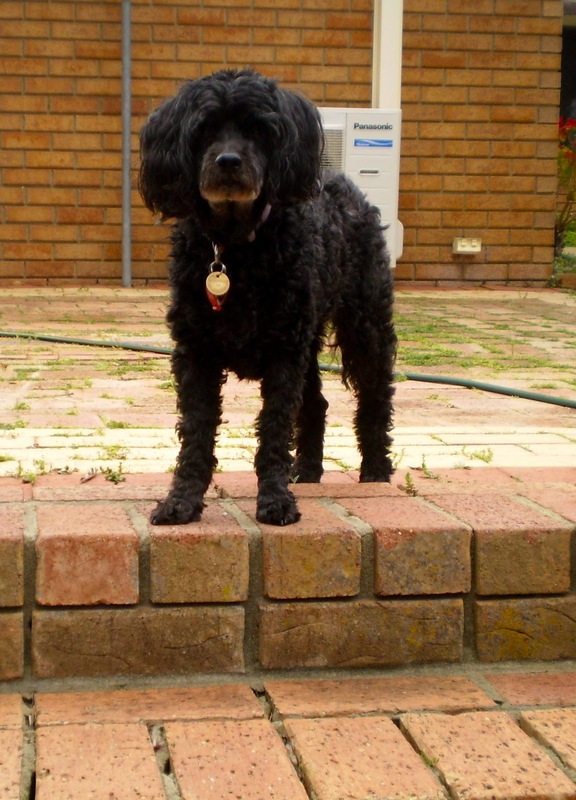 In the morning when I do my Yoga practice on the patio, he spies on me from the grevillea next to the pond. Occasionally he squawks and then swoops over me in quite a threatening way. Funny how the birds like to watch Yoga practice! 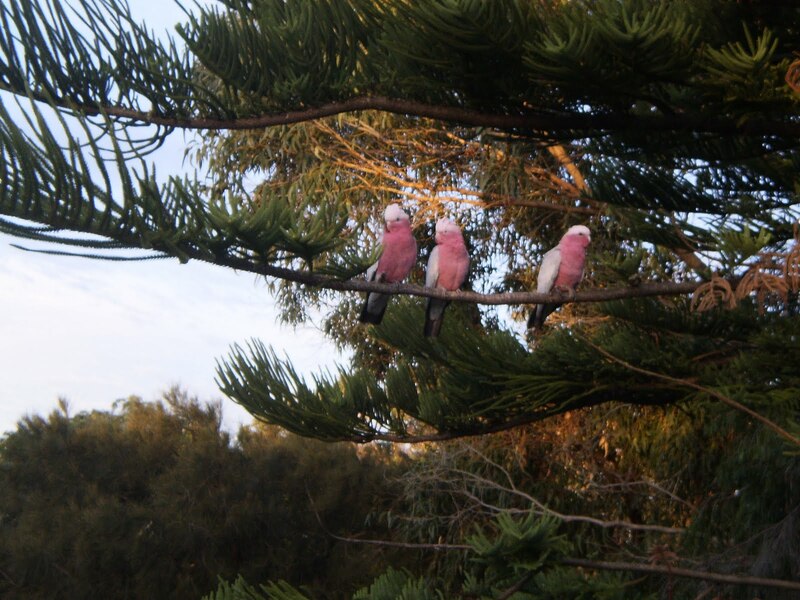 The pink and grey galahs and the maggies are often in the Norfolk Pine having a look! Look at them discussing my style! NaNoWriMo begins in a couple of weeks and all my good intentions of practicing writing every day have come to nought. Why does the time go so quickly as I’ve got older? It really races by and I get quite muddled as to what day it is. Why is it now a risk to ride my bike? I wobble around all over the shop and then get scared I’m going to fall off. This is not helped by knowing that if I do fall off I’m likely to break a bone or two due to osteoporosis. I realise that nothing is certain; I am only as old as the breath I am taking so the thought about riding my bike is fairly useless. Is the cold weather really colder and the hot weather really hotter or is my thermostat giving up the spoek? How come the only doco I can watch on TV (without falling asleep) is Time Team? If I have time to sit and fiddle around on Facebook, how come I don’t have time to polish my shoes? Is it a good idea to take my grand daughters to England in a couple of years for my aunt’s 100th Birthday? I’d like the girls to have a sense of their history and this may be a good opportunity. I have no doubt that my aunt (my grand daughters great, great aunt) will make her century. She is a very determined woman. Why does half a cup of lemon juice improve the taste of red lentil soup? If blogger.com offers me various fonts, why won’t the one I choose apply? I was interested to read the text of Steve Jobs commencement address at Stanford University (June 12, 2005). Apple have always had a brilliant selection of fonts and now I know why. If you are interested, you can read about it if you follow the link. I’ve always had Macs and only one dud in all the years. The dud machine is still sitting on the floor of my study (the screen displayed vertical lines that eventually took over the whole screen and crashed the whole thing). OK, so what is my 50,000-words book about? I have plans but am still not sure if the plans equal a plot and if they do, has it got legs. Maybe I’ll just have to wing it on what little I do have. Last year I already had a story in my head, one that I had been wanting to write for years and years. In the event I didn’t manage to finish in the allotted time although I got up to approx. 38,000 words. That novel is now languishing in my computer somewhere. 50,000 words in 30 days – that means 1,666 words every day. November is the last month that I can work comfortably in the garden. The weather isn’t too hot and the flies and mosquitos are starting but are not too horrendous. This is my conflict and I have a feeling that the garden will come out the winner – unless the flies and mozzies intervene! Writing at night is not an option for me. Early evening maybe but not burning the midnight oil. If I can possibly bring myself to write in this blog each day until the end of October I’ll feel far more confident about finishing the November novel. At least I know nobody has to read this so if it is as boring as batshit, so be it.